for $339,000 with 2 bedrooms and 2 full baths. This 1,033 square foot condo was built in 1970. 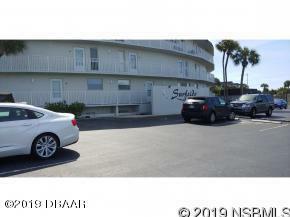 WELCOME TO THE NO DRIVE BEACH IN NEW SMYRNA, AND THIS 2/2 WITH VIEWS OF THE OCEAN AND OVERLOOKING THE POOL! THIS IS SETUP AS A TOWNHOME WITH BEDROOMS UPSTAIRS, AND A SEPARATE ENTRANCE TO AN OUTSIDE BALCONY. CONVENIENT TO CANAVERAL NATIONAL SEASHORE, JB's RESTAURANT, AND THE BEAUTIFUL LAGOON FOR FISHING AND KAYAKING. DON'T WAIT TO SEE THIS ONE! !